but the presence of more meaning than we can comprehend. When I was a girl sitting in church pews—a girl still small enough that my feet swung back and forth because they didn’t reach the floor—I learned that God was holy. Being with God meant spending Sunday mornings in a space like no other in my life, with ceilings reaching three stories high, painted blue like the heavens, and walls of stained glass to my left and right. In that space I learned that mystery and rituals matter in equal portion—that Sunday after Sunday we did the known things we could do in hopes of glimpsing the edges of the unknown things shrouded in mystery. I learned very early on that God is loving and accepting of all, but also that my own potential to sadden him had no bounds. Through unison prayers of confession, I became aware of not only of the many things I could do wrong, but also of the “right” things I left undone. Between the sins of action and those of omission, how could I possibly get through a day unscathed? The God of my childhood was not a God of fire and wrath, but a God of head-shaking and disappointment. It seemed he was always looking down on me, wishing I had made a different, better choice. At high school church camp, I learned the night sky could be the ceiling and the northern Michigan trees the stained glass of a different kind of church. I learned that God could be met anywhere, apart from pastors and acolytes donned in robes, and even apart from my family sitting alongside me in the pew. I also learned, through the testimonies shared around campfires by leather-jacket-wearing ex-convicts and -addicts, that God’s love is bigger than his disappointment, and that he’s in the business of changing lives, not critiquing them. During my senior year of college I sang in a gospel choir at a diverse urban church whose style of worship couldn’t have felt more different from Sunday mornings in the stained-glass church of my youth. In addition to learning the importance of clapping the off-beats, I learned my alto part by listening to the choir director sing it—I learned that God could be found outside of music staffs and key signatures, and beyond written confessions inked on pages at the back of hymnals. In that place people wept their confessions, which were scripted in their hearts. I also learned that God made people raucous and joyful, and that I could get caught up in that joy for a moment or two, but faking it wasn’t the same as making it. My understanding of God had broadened over the years, but now I could see it was still flat, easy to see right through. 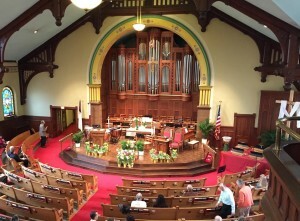 At a church in St. Louis, a couple of years into my marriage, I learned how God works in the lives of grieving people. We arrived just months after the sudden death of the church’s beloved pastor, and while that could have easily been a reason to leave the church, it became a reason to stay: In that place I first glimpsed an entire church full of people being raw and real in the presence of God. I saw a broken community of people trying to make sense of a senseless tragedy, and trying to hold one another up. They worked out their anger with God over months, not hours, and I learned that God accepts our anger, like a father who lets a grieving child beat upon his chest until, finally exhausted, the struggle becomes an embrace. But when my own life was falling apart, a handful of years later in another city, my new church presented me with a different God—one who wasn’t there to absorb and then transform my pain, but to deflect it back on me, to multiply it with guilt and regret in order to help me learn the hard, unforgettable way. In that place, I almost unlearned everything important I had learned about God—the loving and holy mystery that can’t be contained by stained glass, the God of transformative power, who meets us in our raw pain and failures. Instead, I was learning why so many people walk away from it all, as I finally did one bright spring Sunday morning. Until one day a few months later, when I walked into a space that felt nothing like a church, with its coffee stains on the carpet and institutional ceiling tiles above. It was in that place—filled with unpredictable, moving, awkward, painful, and joy-filled people and worship—that God taught me about grace, and about all of the learning I have yet to do. There were many bodies of water to enjoy and explore at my grandparents’ cabin—it was Northern Michigan, after all, where bodies of water are as common as fields of corn where I live now, in Central Illinois. The small, inland lakes had their appealing features: sandy shores for digging, floating rafts to dive from, and glass-like surfaces that perfectly mirrored the evening sky until the canoe you paddled broke through the stillness. But of the many tempting bodies of water, it was the creek that enticed me most. The creek had something the lakes didn’t: It had mystery, a destination. We called it simply The Creek, but on a detailed-enough map it has a proper name: Canada Creek. It probably winds for miles, but our encounters with the creek took place in the far upper-east corner of Michigan’s lower peninsula—right where the cuticle of your index finger would settle in the mitten-shaped map. As elementary-aged kids, my older brother and I were allowed to walk together down a curving sand road until it became a one-lane bridge at the creek. The road was rarely traveled, like all the roads in the area—we were somewhere in the midst of 20 square miles of woods and water known as Canada Creek Ranch (only a fourth of which was dotted with a few hundred cabins). At the creek, my brother and I stood on the bridge for a while, tossing stones into the water to hear them plink and plunk their varying notes. Then we slid and scrambled down the gravely bank to the creek’s shore, where we inevitably ditched our canvas sneakers and sweaty socks to wade in the cold, clear spring water. It was sandy and shallow by the bridge; I liked to stand very still, hoping a dragonfly might land on me, while the tadpoles investigated my toes. But how long could a kid stand still in a creek? After all, the creek had places to go and things to show us. I’m guessing that we schemed and planned our first creek walk when I was about seven, sitting around Grandma’s breakfast table, pancakes piled high and studded with wild blueberries we had picked the day before. 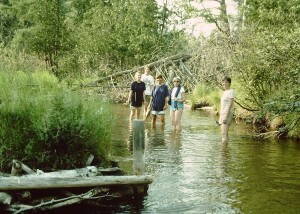 I’m sure my brother and I were persuasive in our desire to follow the creek. Not only did it beg to be further explored, but the creek held potential for so many stories. 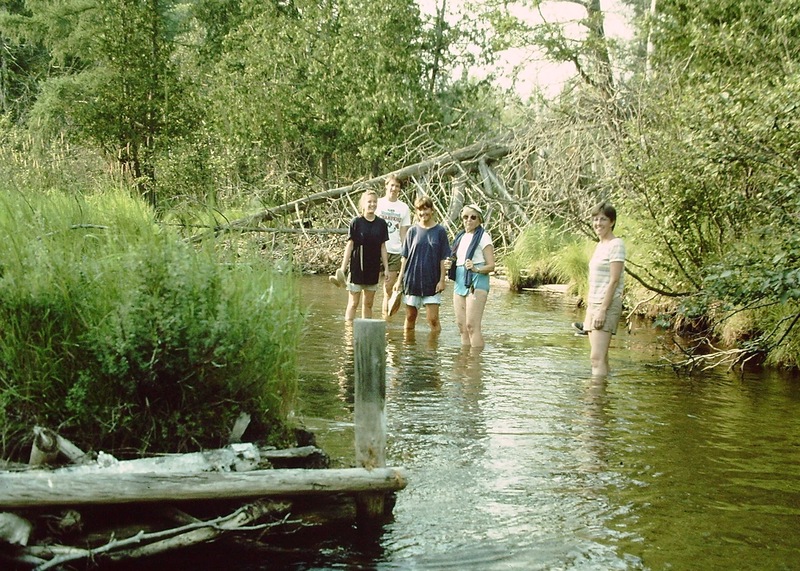 The grownups were apparently just as intrigued, because a new summer tradition was born (one that continued into our teen years, as seen in the photo): The Creek Walk. On Creek Walk day my brother and I set out as adventurers, eager to play the characters in our favorite books—to live out their stories, or more likely a compilation of their stories. Laura Ingalls, Davey Crockett, Lewis and Clark and Sacajawea each took a turn being embodied by us as we forged the stream. And then there were spells when all of us were quiet, amazed by just how quiet the world could be, save for the swish of our legs displacing the water as we walked, and the song of a Goldfinch from somewhere above. Now that I think of it, I don’t recall ever encountering another person on our many creek walks. After three or so hours of pressing on, the heat and deer flies became more bothersome, as did the ache in our legs and the rumble in our stomachs. Grandma began searching for a place to exit the creek—an opening in the tangle of brush where the bank wasn’t too steep and we could make our way from the creek’s winding world into the woods. How Grandma had any idea where we were, I’ll never know. But she had hiked and skied those acres for years, and could confidently point us in the direction of Little Joe, one of the remote lakes on Canada Creek Ranch. We followed deer paths or forged our own way in the direction she pointed, motivated by what we knew we would find at our destination: Grandpa, firing up the grill for hotdogs. Each year on Creek Walk day he put the cooler Grandma had prepared into the car and drove the two-track roads through the woods to meet us at Little Joe’s lone picnic table. After our feast, we all packed into Grandpa’s car, soggy and worn, to drive back to the cabin. The hotdogs and the lift home were luxuries Sacajawea never had, but by that point I was ready to be a modern-day little girl again, tucked into bed where more creek adventures could be spun in my dreams. The dying light of a sunset is an encounter with the aching beauty of the eternal. As I watch the light unfold, my heart also unfolds. Here and longing. Flashes of mystery in the familiarity of light. Two days ago, in the early winter hour of sunset, I drove into the southwest horizon. The crisp, yet not cold, December air felt light and clean as the sun’s horizontal shine blew the heaviness and rush of daylight away. But as the light went its silent way into the deep blue fading sky, low in my chest, something heavy grew. Sorrow and the fullness of joy were somehow interwoven in a single feeling. The black shadows of trees etching upwards like arms and fingers reaching to the sky, like black spires aching in the light, recalled something eternal, something of death in life and life in death. The aching of my heart quivered under the hope the leafless trees promised. But quickly, the image faded. Too often, beauty is a shadow passing–leaving only a thin hope, a momentary awareness of a true home. As it passed over, this thin hope found its place in my heart, a heart now missing a faraway home. Deep in South Texas, my grandmother’s childhood home sits at the base of the Texas hill country and is dominated by slow rises, wide views, and red dirt. Everything about the ranch reminds me of her–rugged and beautiful in a Texas kind of way. It’s an old house complete with a 1980’s Ford pickup to drive the property. On a visit one summer evening, the old pick-up with Texas Country playing on the radio took me to the highest point of the ranch, and I rolled the windows down to watch the sun set into the grey of a coming storm. As the clouds turned from shadows into the surface of a burning sea, the storm and its rushing glory moved towards me. The smell of rain, thick in the vital air, mingled with the vision. Far in the low sky, silent lightning struck. The coolness of the coming rain and the sedation of the setting sun spoke peace, but in the moment, there was also fury…fury in the rising storm and a wild otherness in the red dirt and fiery skies, tremors of holiness within the peace. It was a fleeting sight of a home I did not know, a place I had only sensed. My longing for that home, only glimpsed, is often full of sorrow. I, and all those whom seek, wait. We wait for the Son in the midst of a sullied world. We wait for him to be born. We wait for him to die. In the aching hour of the setting sun, we wait.